The color of flowers is steeped in a deep tradition of symbolism. White flowers are thought to signify purity, reverence, peace, and elegance. Brides use white flowers in their bridal bouquets as a symbol of their innocence. White flowers in funeral arrangements signify peace and a reverence for dearly departed. There are a wide variety of white flowers to choose from that will add beauty and meaning to any floral creation. A traditional choice for wedding bouquets, the calla lily is grown in gardens and as a house plant. Calla lillies are perennial bulbs that grow to be 18 to 24 inches tall. Plant bulbs in rich, moist, well -drained soil and place them in areas of full sun to partial shade. Foilage is a rich shade of green and the flowers, which bloom in late spring, are white with yellow centers. The meaning of the calla lily is beauty and magnificence. Considered to be the fifth most popular flower in the world, gerbera daisies come in a multitude of colors.They are used as cut flowers, in pots and as bedding plants. White gerbera daisies are about 4 to 5 inches wide and have white petals surrounding a yellow center. They are a symbol of innocence. Gerbera daisies can reach heights of 2 feet, grow best in well-drained, rich soil, and prefer to be placed in full sun. Soil should remain moist but do not over-water plants. Known for it's sweet, fragrant, bell-shaped white blossoms that hang from a reed-like stalk, the lily of the valley is easy to grow and is often used in bridal bouquets as a symbol of purity and innocence. Plants reach 6 to 12 inches high and bloom in late spring. 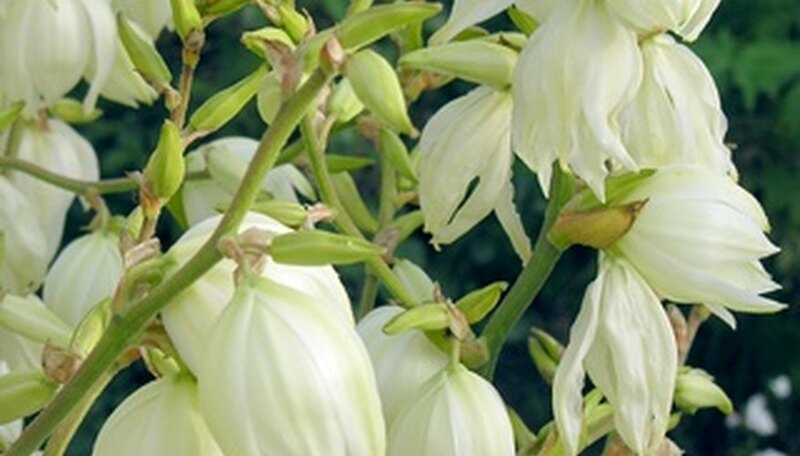 They grow best in partially shaded areas and prefer well-drained soil conditions. Lily of the valley makes a good ground cover; the plants work as borders and as cut flowers. All parts of the plant are poisonous, so keep them out of reach of pets and children. The wedding dance amaryllis, a cultivar of the Dutch amaryllis, is a large, white, bell-shaped flower that is a popular choice for wedding centerpieces and bouquets. Amaryllis is a bulb that can be grown in containers or gardens. Flowers bloom for seven to 10 weeks starting in late spring. Amaryllis plants reach heights of 2 to 3 feet and grow best in moist, well-drained soil. Place plants in full sun to partial shade for maximum flowering. Amaryllis flowers are considered a symbol of splendid beauty and pride. White roses are the ultimate symbol of purity and innocence. Known as the "bridal rose," the white rose is a traditional wedding flower. Roses are planted in the early spring and grow best in well-drained, rich soil. They require at least 6 hours of full sun each day, preferring shade in the afternoon. Water plants regularly when soil becomes dry. White miniature rose plants may only reach heights of 12 inches, whereas hybrid white tea rose plants grow to be 3 to 5 feet tall. Do Gerber Daisies Come Back Every Year?